25% less energy and 33% less water. What should I look for when buying a Clothes Washer? Think carefully about the size. ENERGY STAR certified models are also available in stackable and under-the-counter designs, which fit in smaller spaces. Save the most by choosing a model with a high Integrated Modified Energy Factor (IMEF) and a low Integrated Water Factor (IWF). Integrated Modified Energy Factor (IMEF) is a measure of energy efficiency that considers the energy used by the washer during the cycle and while on standby, the energy used to heat the water, and the energy used to run the dryer. The higher the IMEF, the more energy efficient the clothes washer. Integrated Water Factor (IWF) measures water efficiency in gallons of water consumed per cubic foot of capacity. The lower the IWF, the more water efficient the clothes washer. 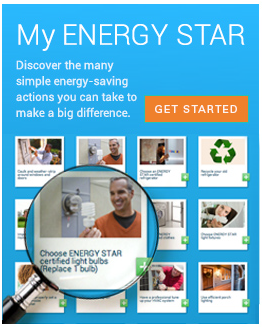 Both IMEF and IWF are provided for each model listed in the ENERGY STAR Product Finder. Most ENERGY STAR certified clothes washers do not have a central agitator. Clothes washers that have earned the ENERGY STAR use next generation technology to cut energy consumption by 25% and water consumption by 33% compared to conventional washers. ENERGY STAR certified clothes washers come in either front-load or redesigned top-load designs. Both configurations include technical innovations that help save substantial amounts of energy and water. Many have sensors to monitor incoming water temperature closely. They also rinse clothes with repeated high-pressure spraying instead of soaking them in a full tub of water. Front-loaders tumble clothes through a small amount of water instead of rubbing clothes against an agitator in a full tub. Advanced top loaders use sophisticated wash systems to flip or spin clothes through a reduced stream of water. Both designs dramatically reduce the amount of hot water used in the wash cycle, and the energy used to heat it. Efficient motors used in ENERGY STAR certified washers spin clothes two to three times faster during the spin cycle to extract more water. Less moisture in the clothes means less energy used by the dryer. For both models, check to see if you need to use special detergent. Low-water washers use special low-suds detergent for best results. Ask your sales representative for recommendations on detergent use. Save in So Many Ways! Choosing an ENERGY STAR certified washer saves you enough money to pay for the dryer. If you're not using an ENERGY STAR certified clothes washer, you're wasting 6 gallons of water every time you wash.
Washers with agitators pull and rub clothes to get them clean. Clothing damage can be seen in the amount of lint in your dryer. Get a shower of water savings. New ENERGY STAR certified clothes washers use advanced technology to dramatically reduce water use. Full-sized washers that have earned the ENERGY STAR use 14 gallons of water per load, compared to the 20 gallons used by a standard machine. Long live your clothes. Instead of twisting and pulling clothes around a turning agitator, front-load and advanced top-load clothes washers use sophisticated wash systems to gently flip and spin clothes through a reduced stream of water. This lengthens the life of often-washed items. Because they are so gentle, many models can safely clean silk, wool and other hand-washables. Take time out. Without a bulky agitator, there is more usable space in the washer for laundry — especially larger items like comforters. More capacity means fewer loads of laundry each week. What will you do with your extra time? Save the environment. Approximately 65 percent of U.S. electricity is generated by burning coal and natural gas, which releases greenhouse gases into the atmosphere and contributes to climate change. ENERGY STAR certified clothes washers use less energy and help us reduce our impact on the environment. By reducing water consumption, ENERGY STAR certified clothes washers also help preserve our lakes, streams, and oceans. Find out more ways to save water and help protect our nation's water supply. Thank you for pledging to purchase an ENERGY STAR certified clothes washer!